The Christian Science Monitor, An Evolving Experiment in Journalism Linda K. Fuller (via google books). The Mary Baker Eddy Library opened in 2002 as a place for people to explore the life, ideas, and achievements of Mary Baker Eddy (1821-1910), a remarkable nineteenth-century New England woman who overcame adversity to write a groundbreaking book on religion, health, and spirituality. She was a woman decades ahead of her time, pioneering such fields as business, education, and publishing. Asher Student Foundation is actively engaged in a variety of ways in supporting Christian Science students of all ages who are enrolled in accredited colleges, universities and certificate programs across the country. Daystar Foundation & Library – Daystar Foundation and Library was established in 1990 with the purpose to collect, care for, and make available books, papers, and memorabilia relating to the early days of Christian Science, its Discoverer and Founder, Mary Baker Eddy, and those individuals who helped her in the fledgling stages of the Christian Science movement. Longyear Museum – Longyear Museum is an independent historical museum dedicated to advancing the understanding of the life and work of Mary Baker Eddy, the Discoverer, Founder, and Leader of Christian Science. 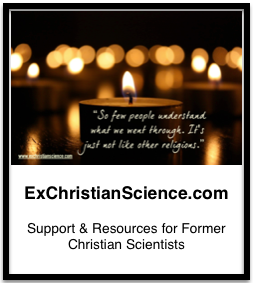 Christian Science in Countries other than the U.S.A.
LBQ‘s blog she’s a CSP. We don’t always see eye-to-eye on matters. Hello from Australia. This is all waaay over the top, and most ungracious to those in the religion who have been there doing their best to support you.